The restaurant website is one of the most important tool for branding, growing the business and engaging customers effectively. It is a critical part of the restaurant’s digital marketing plan. Almost half of the restaurants out there do not have a website or their website is outdated. Some have made their social media pages their primary online presence. Yet, others have made their presence on 3rd-party platforms (microsites) as their primary online presence. That is a huge mistake. Because the business does not own its online presence. This would hurt the business sooner or later. It is important for the restaurant to be available online. When people search the business name or the food, the restaurant website needs to show up on search results. Once visitors land on the restaurant website, whether they stay or leave depends on if they are getting value from the website and if their experience on the website is a good one. Above all else, the website should provide the information customers are looking for plus encourage them to engage online; and ultimately visit the restaurant. An outdated website or under construction websites offer no value to the restaurant or its customers. The goals of the restaurant website can be many. But, if the primary goal of the restaurant website is “conversion”, which is to drive new business to the restaurant, the website design needs to optimize for that primary goal. 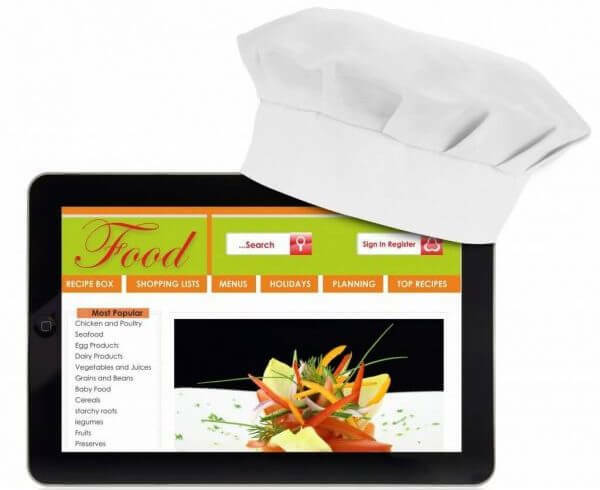 A big majority of people are now accessing the restaurant website from a mobile device. With the smartphones already ubiquitous, people on-the-go tend to search for restaurants either on the mobile browser or mapping app such as google maps, etc. that directly link to the restaurant website. The biggest challenge is the limited screen size when accessing the restaurant website on mobile devices. We need to spare the website visitor from having to pinch and zoom to read and comprehend the information and navigate to site. If the restaurant has a website already, before jumping into migrating into mobile-responsive design, first look the online visitors data to verify that the restaurant website is in fact getting a significant amount of traffic from mobile users to justify the investment in design. This data is easily available from various analytics tools with google analytics being the most popular one and free to use. The restaurant website needs to have google analytics installed on the website. This can be done by creating an account on google analytics website. It is simple to install the Google analytics code. If the restaurant website is a wordpress website, installing the google analytics plugin and plugging in the google analytics id is all that is required. For other websites, google analytics provides html code that can be installed easily on the website. Once installed, you can begin to see data on online visitors. Monitor the restaurant website traffic for a short period of time (1-2 weeks) to get a good sample data. 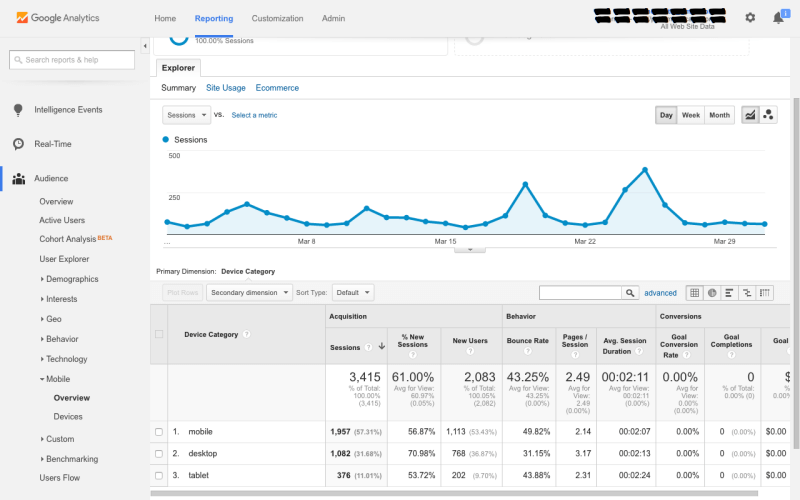 The google analytics data looks similar to the image below. Check the “device category” data and see the split of mobile, desktop and tablet. In this particular example, mobile visitors comprise of over 67% of traffic (mobile+tablet). As you can see from this example, it is vital for this restaurant to be mobile-friendly to serve every 2 out of 3 online visitors. Contact our team to have your restaurant website up by this weekend. 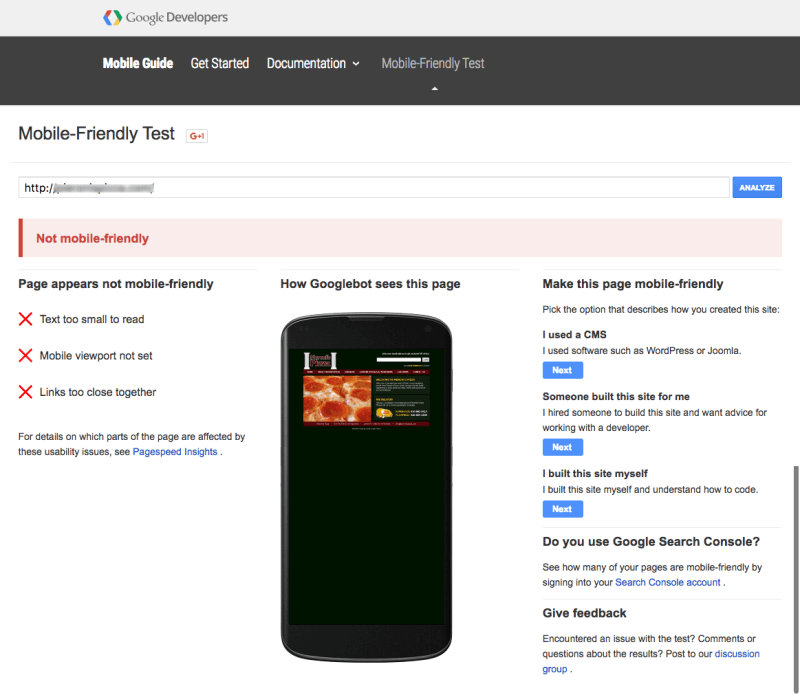 With mobile-friendliness becoming so important, Google itself has provided a tool to test any website for mobile friendliness. Simple input your restaurant website address in this site and let it analyze it for you. It then provides a score and recommendations how to make the site friendly on mobile devices. Below is an example of restaurant website, that did not pass the mobile-friendly test because the text on the restaurant website is too small to read and links too close together making it difficult for the mobile visitor to navigate the website and find the information. With an increasing focus on mobile, Google is also spearheading a new initiative to improve the speed of pages loading on phones and tablets. This initiative is called Accelerated Mobile Pages or AMP in short. If your restaurant website is developed on popular cms platforms such as wordpress, there are currently plugins to enable AMP for your website. For other cms platform, code is available to enable it. The restaurant website should be the single source of “accurate” online information about the restaurant. Potential customers looking for information about your business land on various online platforms (microsites), mobile apps or local directories such as the Yellow pages, Yelp, Foursquare, Google+, Zomato, Grubhub, Groupon, etc. You can manage the information on these sites and keep it up-to-date, but there are a lot of them. The good news is they get much of their information from the restaurant website initially. The bad news is they are not kept up to date over time. Well, it becomes much more important why the restaurant website has to have accurate information at all times. Below is an example of a restaurant website, where the hours listed on Restaurant website, Google and Yelp are not the same. This creates confusion for online visitors trying to decide on the visit times and potential dissatisfaction if they visit close to the restaurant closing times. In the article “The Nuisance of Restaurant Microsites“, we discuss how microsites have been creating a nuisance for restaurants by fragmenting the online presence, leaking traffic and impacting revenues. Additionally, if applicable to the business, catering information, specials, events and announcements should be clearly provided in the website. It is important to refresh the website regularly to remove information that is not relevant such as past events, promotions and deals that have expired. Once visitors land on the restaurant website, whether they stay or leave depends on the “ease of of use” of the website. Ensure that users are not bending their backs to find the information they are looking for. People are fickle and lack patience. A slow loading website will lose their interest. The website needs to load fast. Otherwise, users will simply move on and possibly not return. Limit the use of heavy graphics and animations to improve load times. 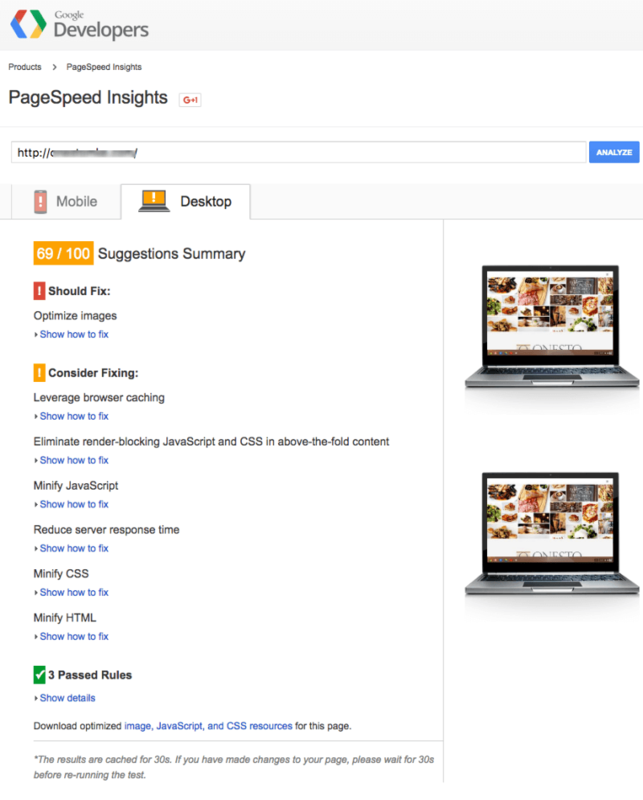 Google provides the Page Speed Insights tool to be able to test the speed of websites. It is free. Below is an example of a beautifully designed restaurant website, with lots of food pictures. When you do run page speed test, the page load times are over 12 seconds. The pagespeed insights score are indicated below. Even though the restaurant website is beautiful, potentially we may see online visitors leave the site (high bounce rates), as users lose interest with slow loading pages. When it comes to “conversion”, we lose an opportunity to engage with the user longer on the website and potentially convert them to dining customers. The restaurant website design must be inviting. Deciphering all the opinions on what makes a website inviting is impossible. The best choice is to keep it simple. From a user perspective, when they land on a website, the site design should invite them to explore and engage with the content further on the website once they find the information they were after. The website design should complement the actual restaurant decor and menu. For a website visitor and a dining customer, the experience from the website to the physical location and vice-versa should be a seamless experience. There are many usability testing tools available on the web, most of them free, that provides feedback on user experience on the website. After potential customers have found the factual information (such as address, hours and menu, etc) about the business on the restaurant website, they now are looking for social proof to make a decision whether to dine or order food from the restaurant. The restaurant website should provide “proof” to help potential customers make the decision. “Who else is visiting this website”, “who are dining at this restaurant” and “what are they saying about this restaurant” are some of the questions guests tend to naturally ask. It is important for the restaurant website to provide integration of reviews, ratings and testimonials from review sites and social media platforms. Easy integration to social media platforms such as Facebook, Twitter, Google+, provide a quick way for guests to visit the restaurant pages on these platforms and like and share with their friends. Social proof can be provided on the restaurant website by publishing the number of likes, follows and reviews; the restaurant website needs to show the good reviews from sites like Yelp or Foursquare to provide the visitor a good first impression. Include things visitors will share on social media. Ideally, we want the first-time visitor to the restaurant website to continue to engage with the restaurant digitally, so that the restaurant is on top of their mind when it comes to dining choices. Connecting with your website visitors is a very effective way to engage with them and potentially turn them to customers. Social media and email are good online mediums to start and have an ongoing connection with your guests. The email list is one of the most important online assets the restaurant must grow and nurture. Every restaurant website must provide ways to subscribe to the restaurant email list. Email signup forms should be placed in multiple, relevant locations such as the specials page (signup for our email list to receive special offers), contact us form (stay informed on updates), and popups on the website. In the article “7 Restaurant Email Marketing Strategies to Boost ROI” we discuss strategies to have an effective email marketing program for your restaurant. We cover the strategies to get a positive return on investment on marketing leveraging email. In another article “7 Ways for Restaurants to Increase Facebook Engagement” we discuss Facebook’s declining organic reach and how to grow engagement effectively. Though Facebook is still a strong force which every business should leverage, we do not control any content or policies on Facebook that can change. It is smart for a business to build, grow and nurture its own assets such as their website and the email list. Photo gallery – Photos are visually engaging. The restaurant website should have a photo gallery that is regularly updated with photos of the restaurant, food and events. Location based personalization – selecting the nearest restaurant location based on the user’s current location. This is relevant for multi-unit restaurants. Online ordering– for customers ordering food online and either pickup of having it delivered to their home or other locations. Online reservations – for reserving a table for a particular day and time. Search engine optimization – optimize the website so that when people search for food or food related topics, the restaurant website shows on the first page results. Content marketing – creating various forms of content such as articles, recipes, photos, videos to create interest among visitors and engage with them. Web analytics – capture and analyze website data to be able to analyze traffic, unique users and other web data to make data-supported decisions on the website itself and business decisions. Flash – that technology is outdated, makes a website load slower and is not viewable on many mobile devices. Background music – that concept is also old and is just not relevant today. External advertising – Do not place Google AdSense ads on the restaurant website. You could consider in-house ads, but never external ads. Restaurant websites come is a variety of shape and sizes. They are at various levels along the maturity curve. On one end is a basic 1-2 page website generally hosted on a free hosting service. Often these websites have the basic information (#1) and generally load quickly (#2) because there is not much content on it. On the other end, few are well-developed websites with high-traffic and engagement. These websites have all the 5 in place in addition to other features. Need a restaurant website? We design mobile-responsive websites for restaurants and pizzerias with online menus and integrating online ordering and reservations.Get your website built fast and go live within 72 hours. Does your restaurant website have the 5 must-have features today? Is the restaurant website helping drive customers and revenue for your business? Tell us what is working and what you plan to improve. Is there anything else that is innovative that you have implemented on your site. Share it with us in the comments area.